Huang Xiaozhou of the Xiamen HIDZ Management Committee, Qi Lian, Unigroup Director and Ziguang Hulian Chairman, and Chris Crane, General Manager of the Microsoft Business Cloud Division, sign the agreement. DYXnet’s parent company, 21Vianet Group (NASDAQ: VNET) has formed a joint venture with one of China’s leading IT services firms, Unisplendour Corporation (UNIS), to provide advanced and hybrid cloud services to Chinese enterprises. 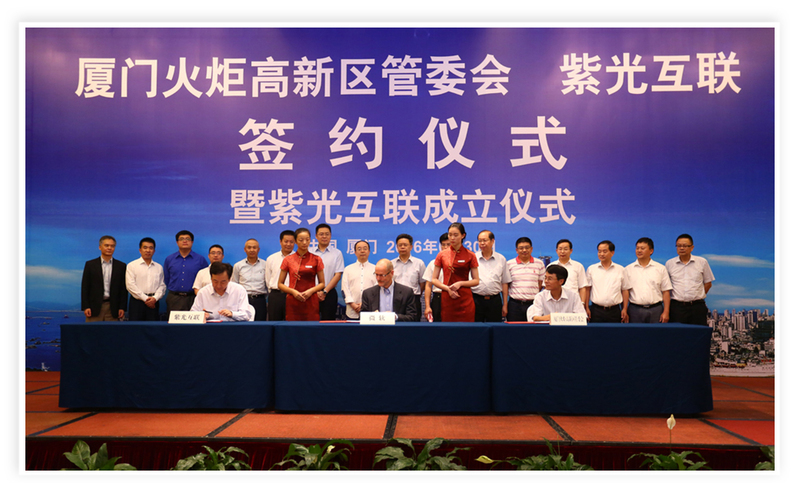 The new JV, Ziguang Hulian (紫光互聯), was formally established at a signing ceremony in Xiamen at the end of June 2016. 21Vianet Co-founder and Chairman, Josh Chen, UNIS Director and JV Chairman, Qi Lian, and representatives of the Xiamen Municipal Government, the Xiamen Torch Hi-tech Industrial Development Zone (HIDZ) and Microsoft took part in the ceremony. 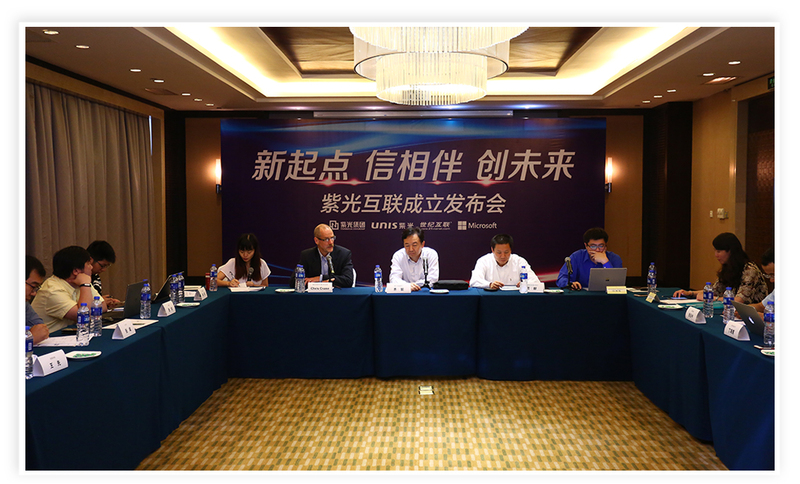 Formation of the JV follows a strategic cooperation agreement between 21Vianet Group, UNIS and Microsoft at the Eighth US-China Internet Industry Forum last September, strengthening their in cloud services cooperation and committing to jointly create “Xiamen Cloud Island”. 21Vianet, UNIS and Microsoft at a joint media conference last September. Using Microsoft's cloud technology, the new JV will provide industry-leading, neutral, secure and tailored hybrid IT solutions for Chinese customers. Xiamen Torch HIDZ will adopt Microsoft Azure and Office to build a hybrid cloud platform, providing a springboard for further cooperation with the US partner. The cloud services will gradually expand into all areas, including government, finance, education, and industries. The new JV bears the same strategic vision of 21Vianet in hybrid IT, combining domestic and international cooperation into one. Ziguang Hulian will use 21Vianet’s nationwide network of data centers, interconnected platforms and 24/7 operational capabilities, combining with UNIS’s long experience in serving state-owned enterprises and Microsoft's advanced hybrid cloud and Big Data technologies to create tailored cloud solutions that meet customers’ needs and comply with information security regulations.The new JV is also expected to help Xiamen develop its cloud computing and Big Data industry chain.